JFL told The Register he had scrambled the data on several devices as part of security measures for his business, a small software company. He was arrested on 15 September 2008 by officers from the Metropolitan Police's elite Counter-Terrorism Command (CTC), when entering the UK from France. Sniffer dogs at Gare du Nord in Paris detected his Estes model rocket, which was still in its packaging and did not have an engine. 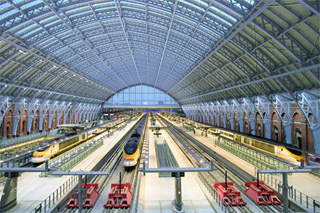 On arrival at St Pancras, JFL was detained under the Terrorism Act and taken to Paddington Green police station, a highly secure facility where UK police hold their most dangerous suspects. He was returning to the UK for an appointment with customs officials, to surrender after a missed bail appearance. This separate customs investigation - since dropped without charges - surrounded a failed attempt to enter Canada, and JFL missed bail following a move to the Netherlands. This contact with British authorities was apparently part of CTC's decision to arrest JFL. While interviewing him, CTC, the unit that in 2006 replaced Special Branch as the UK's national counter-terror police, also seized more luggage. JFL had sent packages separately via Fedex to the Camden Lock Holiday Inn, where he had booked a room. Throughout several hours of questioning, JFL maintained silence. With a deep-seated wariness of authorities, he did not trust his interviewers. He also claims a belief in the right to silence - a belief which would later allow him to be prosecuted under RIPA Part III. A full forensic examination found nine nanograms of the high explosive RDX on his left hand, but JFL was given police bail. His passport was seized, however. JFL says he does not know how the RDX, which has has military and civil applications, came to be on his hand. A result of five nanograms or less is routinely discounted by forensics and no charges were ever brought over his result of nine nanograms. He returned to Paddington Green station as appointed on 2 December, and was re-arrested for carrying a pocket knife. During the interview CTC officers told JFL they wanted to examine the encrypted contents of the several hard drives and USB thumb drives they had seized from his Fedex packages.